This year we purchased a space in a community garden in addition to our backyard space. It's a 10 x 20 foot plot located approximately 5 miles from our house. Our plan is to use the other garden for space loving plants that are harder to fit in our urban backyard. It might be crazy as we already have a lot to keep up with, but we wanted to give it a shot. 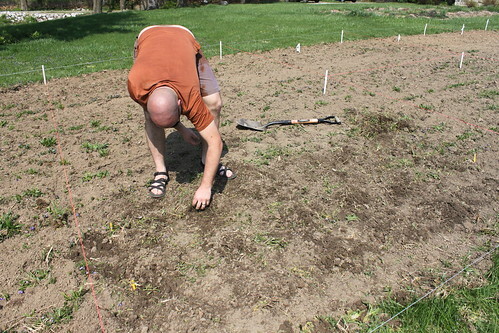 We started with three rows of potato hills. If all goes well between these rows, the potato tower, buckets, and a strawbale pile, we will be eating homegrown potatoes all winter! In a few weeks we will direct sow squash, popcorn and quinoa. All should require infrequent care and hopefully will survive with once or twice weekly checkups. We are committed to sharing our harvest. 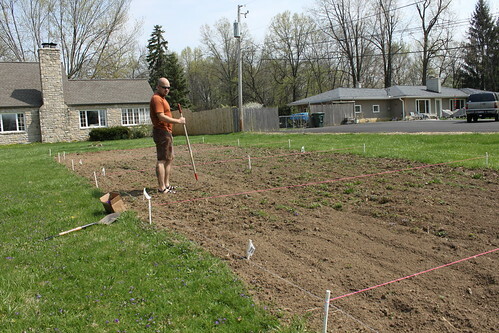 Just like last year, at least 10% of what we grow will be donated to Clintonville Community Resource Center. Are you community gardening this year? Are you donating any of your harvest?